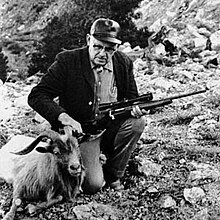 Parker Otto Ackley (May 25, 1903, Granville, New York – August 23, 1989) was an American gunsmith, barrel maker, author, columnist, and wildcat cartridge developer. The Ackley Improved family of wildcat cartridges are designed to be easily made by rechambering existing firearms, and fireforming the ammunition to decrease body taper and increase shoulder angle, resulting in a higher case capacity. Ackley improved not only standard cartridges, but also other popular wildcats, and was the first to create a .17 caliber (4.5 mm) centerfire cartridge. Ackley began gunsmithing full-time in Oregon in 1936, but was interrupted by World War II. In 1945, he established a new shop in Trinidad, Colorado, and soon became one of the largest custom gunmakers in the United States. He was also on the staff of the magazines Guns&Ammo and Shooting Times, and was an instructor at the Trinidad State Junior College from 1946 to 1951, where he did much experimentation in the field of firearms. For a complete biography read the book, "P.O. Ackley, America's Gunsmith" ISBN 9781440247590. The following is a list of Ackley cartridges, both "Improved" versions (requiring only fireforming) and more complex versions involving case length reductions or caliber changes. In addition to being easy to form, firearms chambered for the "Improved" cartridges could fire standard factory loaded ammunition as well, allowing a shooter to use commonly available ammunition if the wildcat loads weren't available. .228 Ackley Magnum, an improved 7×57mm Mauser necked down to .228 caliber (5.8 mm); bullets in this size are hard to find but provide greater weight than .223 caliber bullets, up to 100 grains (6.5g), without excessively quick twist rate. 6mm AR Improved / 6mm AR Turbo, an improved 6mm AR (itself a necked-down 6.5mm Grendel). 7×57mm Mauser Ackley Improved, an improved version of the 7×57mm Mauser cartridge with 40 degree shoulder, dies readily available. .280 Remington Ackley Improved, an improved version of the .280 Remington cartridge with 40 degree shoulder, dies readily available. It duplicates the ballistics of the vaunted 7mm Remington Mag, with 30% less propellant used and less barrel erosion. Registered with SAAMI by Nosler. 348 Ackley improved Which is a .348 Winchester .348 Ackley improved gets about 200 feet a second more velocity over the standard. .35 Ackley Magnum No. 1 and No. 2 short, based on the .30 Ackley Magnum cases; there is also an Improved version of the No. 2. Ackley was not just a wildcatter, he was a researcher as well, often testing firearms to destruction in the search for information. He also produced a number of experimental cartridges, not intended to be practical, but rather to test the limits of firearms. One of these experimental cartridges was the .22 Eargesplitten Loudenboomer. This humorously named cartridge was developed by Ackley for Bob Hutton of Guns & Ammo magazine, and was intended solely to exceed 5,000 ft/s (1,500 m/s) muzzle velocity. Ackley's loads only managed 4,600 ft/s (1,400 m/s)(Mach 4.2), firing a 50-grain (3.2 g) bullet. Based on a .378 Weatherby Magnum case, the case is impractically over-capacity for the bore diameter, and so the cartridge remains a curiosity. The advent of new slower-burning smokeless powders may have changed the equation. Another humorous round, the .17 Flintstone Super Eyebunger, based on the .22-250 necked down to .17 caliber, has been used by Australian gunsmith Bill Hambly-Clark, Jr. to achieve velocities of 4,798 ft/s (1,462 m/s) out of a 52-inch (1,300 mm) barreled gun. A .243 Winchester (right) beside the Ackley Improved version; note that only the shoulder angle is changed to the sharper shoulder angle typical of the Ackley Improved cartridges. In this instance the shoulder diameter of the Improved normally remains the same as the original case at .456"-.457" with no significant change in body taper. However, minor variations exist with some drawings showing a slightly larger .460" shoulder diameter. NOTE: The term "Ackley Improved" has been applied by various gunsmiths conceptually to many cartridges not extant during P.O. Ackley's lifetime. By P.O. Ackley's definition of Improved, a firearm so chambered must be capable of shooting the factory original round, also such cartridge case either necked up or down to a different bullet size, without stretching the case. To accomplish this, the chamber for a rimless bottle necked "improved" cartridge must be somewhat shorter in the body than the original so that there is no headspace when the round is chambered. ^ Deseret News | SERVICES PLANNED MONDAY FOR GUNSMITH PARKER ACKLEY. ^ Dave Moreton (May 1968). ".17-Caliber Ultra Bomb!". Guns & Ammo. Archived from the original (– Scholar search) on December 28, 2007. ^ P. O. Ackley. Handbook for Shooters & Reloaders. Plaza Publishing. ISBN 99929-4-881-7. ^ a b Frank C. Barnes, ed. Stan Skinner (2003). Cartridges of the World, 10th Ed. Krause Publications. ISBN 0-87349-605-1. ^ Dave Anderson (April 2003). "Pumping up the .223: experiments with a self-loading .223 Ackley Improved". Guns Magazine. Retrieved 2008-06-10. ^ Ackley, P.O. (1927) . Handbook for Shooters & Reloaders. vol I (12th Printing ed.). Salt Lake City, Utah: Plaza Publishing. p. 442. ISBN 978-99929-4-881-1. Archived from the original on 2017-07-08. Retrieved 2008-02-13. This page was last edited on 3 December 2018, at 06:38 (UTC).